J/160 fulfills the dream. J/Boats bring you an investment-grade sailing yacht that promises you a greater sense of joy and satisfaction at the end of a day's cruise than is possible on any other yacht. Advanced composite construction, an easily driven hull shape and a very low center of gravity results in noticeable differences in how J/160 performs compared to any other boat you may have sailed. Less sail is needed, winch loads are reduced, and the constant sail-changing of heavier displacement cruisers is avoided. The need for extra crew to run the yacht is no longer a requirement. 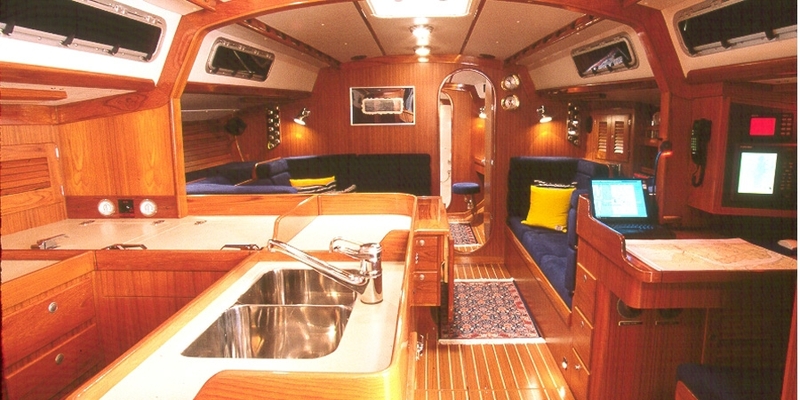 J/160 is as easy to handle and sail as a traditional 42 footer. This is a boat which 2-3 people can manage without reliance on powerful and heavy electro-mechanical devices. In terms of speed, J/160 is in the 60-70 foot spectrum. Consider VMG (Velocity Made Good, either directly into the wind or directly downwind regardless of tacking or jibing angles). A J/160 sailing to windward at 8 knots has a VMG of 6.3 knots straight into the wind. Of course on a reach in moderate wind you'll see over 10 most of the day - faster and quieter than trawlers with no rolling about or extreme fuel bills. The design mandate for the J/160 was to exceed all prior standards for a cruising yacht of this size. One had to feel a sense of joy and control at the wheel as the boat leapt forward in a gust of wind with power and stability. Putting the rail under or shortening sail shouldn't happen under 20 knots of wind. J/160 had to slide effortlessly through waves upwind, keeping the crew dry and leaving no signature quarter wave. Running in seas, it had to slide with great directional stability and good forward buoyancy to ride up over waves ahead. The sail plan had to be manageable, versatile and balanced yet powerful enough to stabilize motion in waves for a quantum improvement in sailing comfort at sea. As for aesthetics, J/160 is traditional in a functional and purposeful way. Short overhangs are combined with a smooth sweep of the sheer line and low freeboard to reduce wind resistance and facilitate boarding. The bow sections are flared to deflect waves downward, keeping the decks dry. The triple spreader rig conveys a graceful power, giving no hint of how easily it is managed. The interior is spacious, clean in execution, beautifully appointed and exquisitely finished, befitting a proper flagship. Every detail and need has been addressed in terms of provisioning, equipment and storage space for coastal and offshore cruising. The live-aboard comfort and styling of this yacht goes far beyond what you might expect from J Boats whose reputation was first built in world class racing. That racing heritage is an invaluable bonus when it comes to quality of construction and many years of problem-free ownership. The 10,000 boats built by the J Boats/TPI partnership have been pushed to the limit by aggressive sailors on the oceans of the world to win just about every major race. To do that they have to finish. What's more, these same boats come back year after year without losing their performance edge. J/160 exceeds what you might expect on this score as well, representing a significant step forward in quality construction and strength to weight ratios. The J/160 PIPE DREAM sailed 40,000+ miles to set course records in the Annapolis-Bermuda Race and log 1,000 mile runs over four days on three separate occasions to win its division of the Expo'98 Round the World Rally. Ask any of the first 20 owners: J/160 has put this American yacht into first place worldwide when combining ease of handling, performance and cruising comfort. PIPE DREAM hit four 55 knot storms off the Cape of Good Hope where the strong Agulhas Current goes up against gale force winds creating huge square waves known to crack freighters in half. Motorsailing with feathered, reefed mainsail at 10 degrees apparent, right into the sea, the J/160 could make port doing 7-8 knots. Most boats become unmanageable in such sea-state and winds. Because of advanced composite construction J/160 is built twice as strong as hand-laid fiberglass boats. It's built to take such abuse. Sailing competitively around the world, five people became the ideal crew size to manage this 53 footer around the clock in all conditions. Seasoned offshore sailors said they'd never sailed a boat like this in their life. Imagine surfing with a chute hitting a top speed of 18.6 knots and taking your hands off the wheel. Her high length to beam ratio and buoyant forward sections provide exceptional tracking in large seas. J/160 combines good offshore design (unfettered by racing rules) with SCRIMP building process and Hall carbon spars for a low center of gravity to attain a smooth 9 knots of performance under sail or power. For easy running with tradewinds, J/Boats' innovative asymmetric spinnaker system incorporates a retractable carbon sprit and snuffer.